Yes, right ….. sometimes we take a vacation without the other half. Approximately every 2 years I go on vacation with my mom and since Andreas started a new job in the middle of 2016 and therefore could not take a vacation, this was the perfect opportunity. So far, my mom and me booked vacation packages. But this time everything should be different. After visiting India with Andreas and experiencing how to plan an individual holiday, I thought that my mom and I could try that too. My mother actually gave me a free hand … but of course I’ve tried to pay attention to all the things she likes to do. That’s why I came to Bali. It is a very beautiful island on the one hand and very touristy on the other. 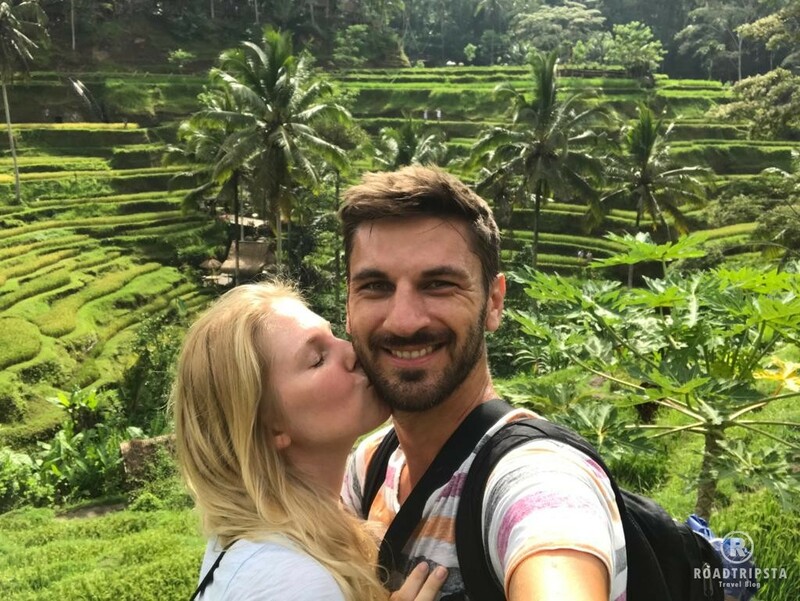 Since this was my first self-planned individual vacation ever, I wanted to play it safe ….. and in Bali everything is so touristy, that you can easily get from A to B, organize an accommodation and leisure activities. Our itinerary looked like this. The first days we spent in Ubub and made day trips from there. Then we went on to the Gilis to relax for a few days and on to Lombok. The last 2 days we spent on Nusa Lembongan, before going back home. But from the beginning ….. So that we do not spend the days in Ubud with nothing to do, I had organized some leisure activities in advance. 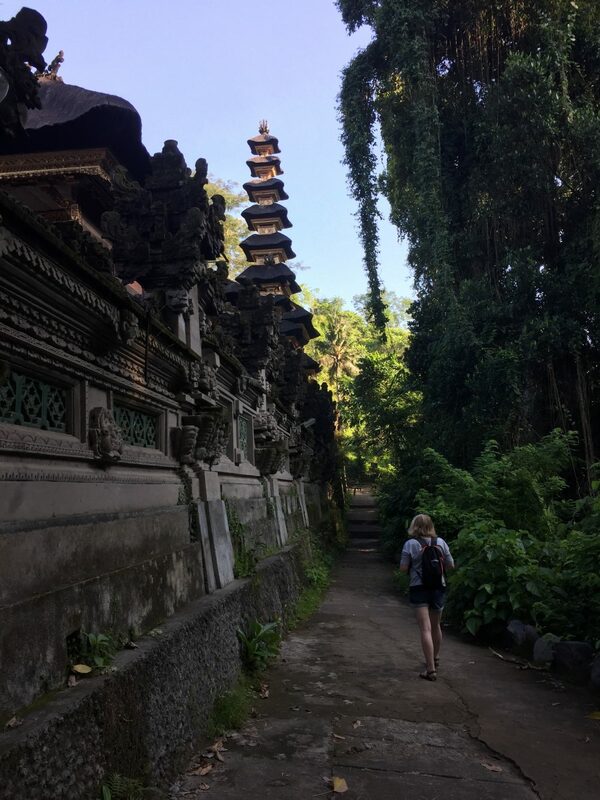 The plan for the 4 days in Ubud was the Campuhan Ridge Walk, the Monkey Forest, a day trip to the northern part of Bali, a volcano trekking and a rafting tour. It sounds a lot, but it was not. Our first day in Bali started with a walk on the Campuhan Ridge Walk. We started right in the early morning, because I have read several times that the way in the blazing sun is not recommended. Since we are both early birds, that was no problem for us. The path is really beautiful and is a leisurely morning walk. For us this was the perfect start to get a first impression of Bali and Ubud. Our second goal was the Monkey Forest. 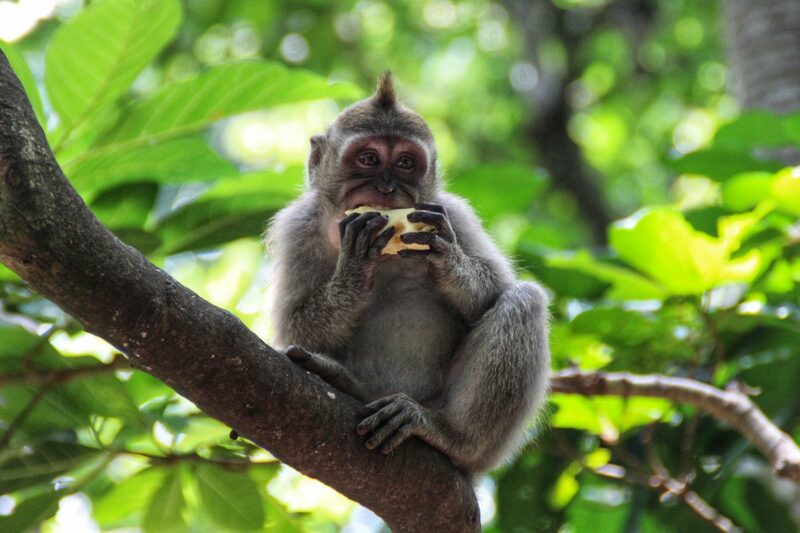 Already on the first day in our hotel we noticed that we live very close to the Monkey Forest …. The monkeys were namely on our hotel balcony. We had to always make sure that the balcony door is closed and nothing is lying around. The visit at the Monkey Forest was great. For my mother is was a first-hand experience with the monkeys. The backpack she carried aroused the interest of a monkey so much that he crawled around on her back, trying to open it. We found the situation very funny … but if the monkeys are too obtrusive, there is park staff in the Monkey Forest who can help you. We booked the day trip “SINGARAJA” LOVINA “TOUR” to the north of Bali at Amansuka Tours. I had read many good reviews in advance and the tour to the north included many attractions that we wanted to visit. Since this was a private tour without other tourists, we were very free with the time schedule. Our guide was very friendly, explained many things to us at the individual spots and was always available as a photographer. 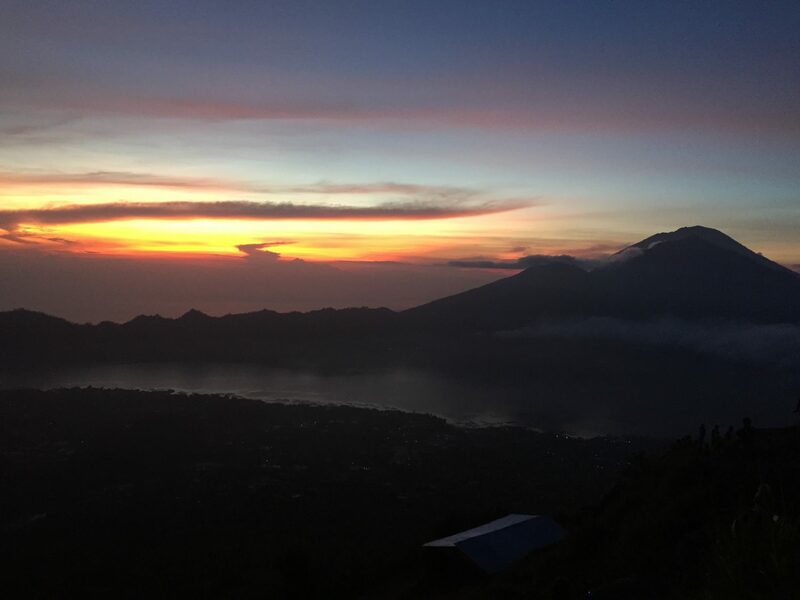 Our highlight in Ubud was definitely the volcano trekking at sunrise. 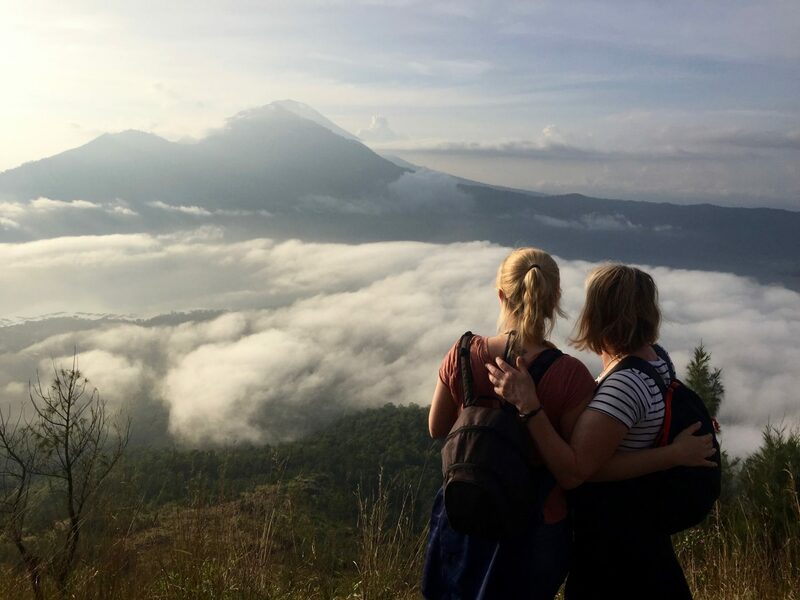 Here, I’ve also looked for providers on Tripadvisor and I’ve come across the provider Bali trekking Tour, who chooses a different route to the top of the mountain, than most other providers. That´s why we could make the ascent without many other tourists. The ascent we had imagined a little easier than it was. The hike took us about 2 hours to get to the top. The first part of the track was still quite flat and easy to handle. However, the second part went steeply uphill, partly over high rocks, which was not so easy (especially for my mother). Her statement afterwards was: “Had I known beforehand, how exhausting that would be I would not have done it … but it was worth it anyway”. The climb was really exhausting … ..but just in time for the sunrise we arrived the top of the volcano. The sunrise behind the mountains was beautiful. While we could enjoy the view, our guide cooked us eggs in the volcanic steam and made us coffee …..the breakfast we had really earned. After breakfast and some photos we went to the very fast descent. This time we used the normal tourist route and made some great pictures on our way down. At noon we were already back at the hotel and have used the rest of the day to relax by the pool and let us knead properly in one of the many spas. 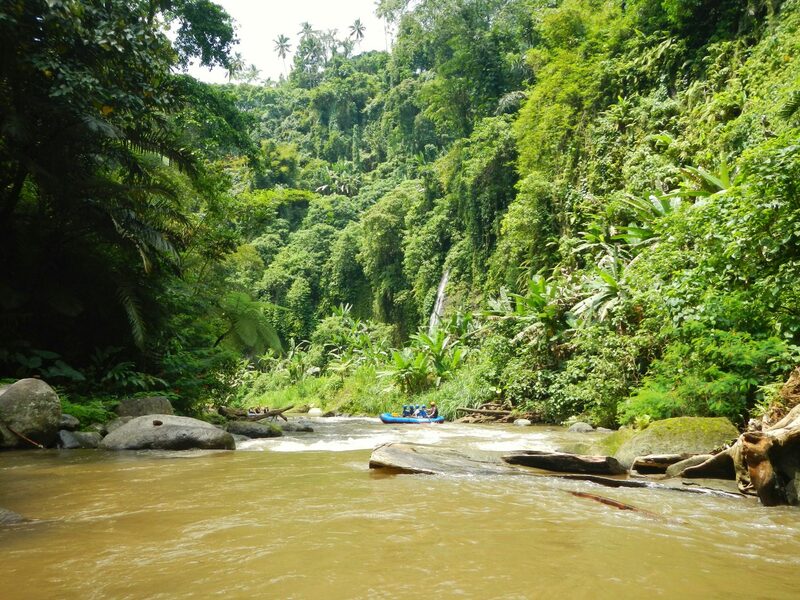 On our last day in Ubud, we did a “wild” water rafting tour on the Ayung River. The water was not so “wild”, but it was fun anyway. But one disadvantage had the tour. It is one of the tourist activities that is very crowded. A lot of boats were lowered into the water and you always had several boats in front of and behind you. If there would have been less tourists, the tour would have been a lot better. For someone who has never done anything like this, it’s still a great experience in my opinion.